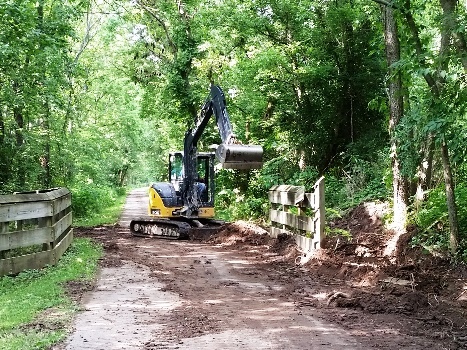 The Ohio Department of Natural Resources (ODNR) had their heavy equipment on the trail July 12th to clear some of the clogged culverts and a low bridge in the area around Oregonia. 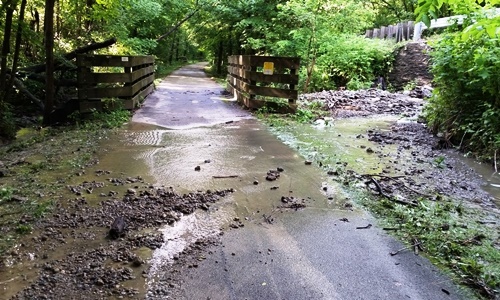 Those of you using the trail in that area are probably aware of the mud, gravel, and debris washing over the trail, especially at the low bridge at MM 18.3 and the culvert at MM 19.4. Heavy rains and flash flooding in the spring washed debris down clogging these areas. 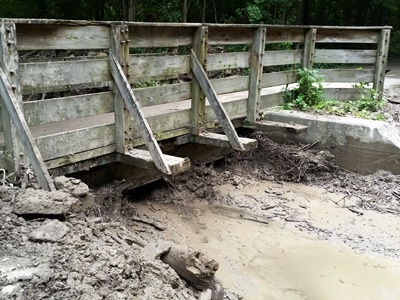 Subsequent heavy rains added to the problem, leaving mud and debris on the pavement, several inches thick in some places (see photo below). ODNR and FLMSP volunteers attempted to keep the trail clear in these areas but the heavy rains continued into this summer. ODNR took their equipment in to clear the severely clogged low bridge at MM18.3, taking out six truckloads of rocks, mud and gravel. An FLMSP volunteer then assisted with clearing the pavement of the dirt and mud left behind. 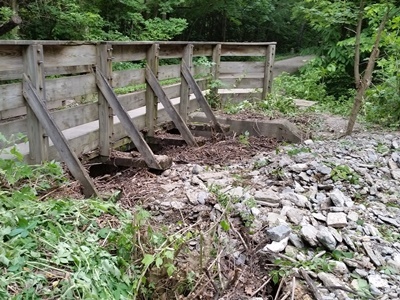 The completed work should make this stretch of trail much safer. Photos below show the bridge before and after.